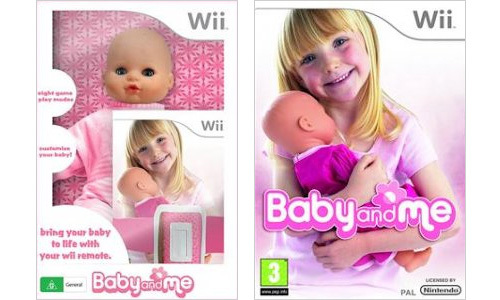 Baby And Me Special Edition For Wii Comes With Most Unnecessary Accessory Yet | OhGizmo! And if you can’t find the special edition, since they’ll no doubt be flying off the shelves, the standard version of the game includes a holster so you can strap a Wiimote to an existing doll of your choice. even the little girl in the picture is Creepy. I agree, it looks like bad photoshopping. Lower the purple hue please. So the remote is strapped onto the doll? So your holding a doll with a big Wii remote on it's chest… how is that a good accessory? There should be a port in the back to lock it in. I mean does it wet itself too so that you have to change it's diaper?? So not realistic. yeah but think how fun it would be to put remote in the baby and then play a game like wii tennis. OK, first I have to check on the supply and demand. Then based on availability I can buy up 10 or so, hold them until a week before Christmas and then sell them on Ebay for a 1000% markup. Not worth it unless there is a “Shake the baby” mini-game.